This is part 19 in a series of articles on obscure programming languages. Script.NET (also known as S#) is an open-source metaprogramming language that adds scripting capabilities to Microsoft .NET applications, similar to VBA in Microsoft Office applications. I saw the James Cameron movie Titanic again the other night. In the scene shown above, the band plays on with grace and dignity, while the ship slowly sinks, and all hell breaks loose around them. Qink has assembled a comprehensive list of freely-available libraries for the Microsoft .NET platform. The serious point behind this funny article is how each of these Microsoft “revolutions” were supposed to be the panacea of Windows development, only to be replaced in a few short years by the next-best-thing. At least Microsoft has stuck with .NET Framework for 8 years, but the churn continues within the .NET development ecosystem. Remember how WindowsForms was supposed to provide a rich client GUI that ran across all hardware platforms? Turns out it didn’t work so well in a web browser, so Microsoft invented WebForms. And MVC. WinForms also didn’t render well on Linux, so open-source geeks use Gtk# instead. And WinForms is too heavy to run on mobile devices, so Microsoft ejected it from the .NET Compact Framework. But .NET CF is too “old school” for smartphones, so now there’s Silverlight. Are you following me? In the tech industry, the only constant is change. 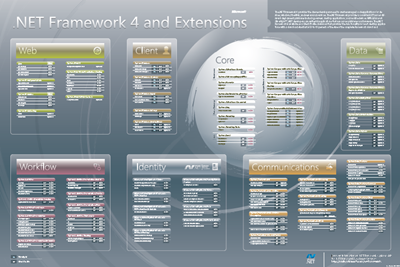 Click the image above to download a .NET Framework 4 and Extensions poster from Microsoft. Want more .NET posters? Devcurry has published a collection of .NET Framework and Visual Studio posters including keyboard shortcut, namespace and type posters. Microsoft is releasing Visual Studio 2010, .NET Framework 4.0, and Silverlight 4 at the Visual Studio Developer Conference in Las Vegas. VS 2010 and .NET 4 are available today, and Silverlight 4 will be available to download later this week. The Release Candidate (RC) for Visual Studio 2010 and .NET Framework 4.0 is now available to the public. The biggest change from Beta 2 is a major improvement to Visual Studio performance, specifically as it relates to loading solutions, typing, building and debugging. The RC includes a “go-live license” for companies that wish to deploy Visual Studio 2010 in their production environment.